Inspired by the unbelievably good job Ninjasaurus Rex did on his birthday present for me, I started work on my own flat block for Stalingrad/Berlin. At various conventions over the past few months, I had bought a few buildings from Commission Figurines, they were reasonably priced and lovely MDF models to boot. The one I began work on was CBP1 15mm Berlin Strasse. It was the smallest one I had and thought it would be a good starting point. The kit consisted of several pieces; the building front and back, two sides, four pavement/base parts and a ruined floor. I have been struggling to work out the best way to construct these MDF buildings, that is until I saw Ninjasaurus' finished piece and since he had described the way in which he had made his, I thought there was no point in reinventing the wheel, I'd follow his lead. First thing to do was the fix the base together, this was very simple using PVA glue, clamps and elastic bands. I left this at least 24 hours to set and laid it to one side. Looking at the rest of the pieces I turned my attention to the ruined floor. The building was going to be used in Rapid Fire games and as this is battalion level, the buildings are slightly abstract. The finished building was going to be open to the sky, both to represent a building smashed to pieces by heavy bombardment or bombing and fires burning the wooden floors, also this would allow easy access for figures in a game. 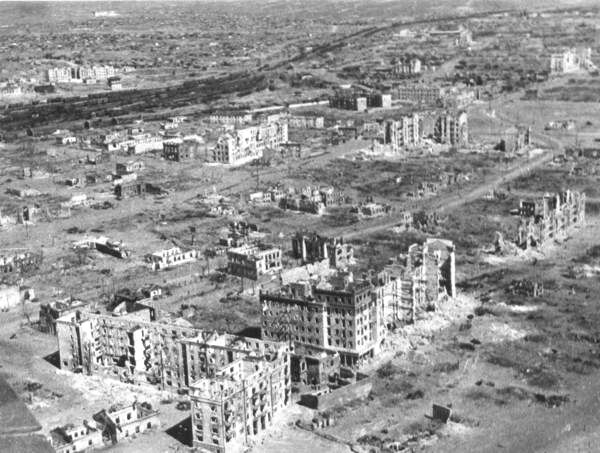 It's realistic anyway, just look at any photo of Stalingrad after the battle and you'll see most buildings are just shells with all the wood burnt away or smashed to the ground. Therefore, I didn't need the floor piece, as nice as it is, for its intended purpose. However, instead of throwing it away, I cut it into its constituent beams. If they had been designed as 15mm wooden floor beams, I may as well use them for their that in heaps of rubble. I wasn't very neat with the cutting and the way that they splintered was very useful to represent smashed wood. The next thing was to paint the beams. I bought a couple of boxes of long matches and splintered them up by hand, then I mixed up some tempera paint that Ninjasaurus had given me to use as weathering powders. I mixed Black and Burnt Umber together to get a mucky brown colour, this was added to water and all the matches and wooden beams thrown in. I figured the safest thing to do was to dispose of them like a sensible adult. Which basically meant I put them on a plate wrapped in kitchen towel and set fire to them! What an explosion! After the excitement of the explosion, I went back the building. I wanted to recreate the remains of the floor levels within the structure. I had discussed this with Ninjasaurus and his method was to paint a thin line of PVA glue sprinkled with really smooth sand to create the desired effect. This would simulate all the little bits that get caught between wooden floors, the detritus of wood, dust, insulation and the like, plus it would detract from the smooth interior walls that the model originally has. This was quickly achieved and I created the remains of three floors on the walls, I used the ruler to 'tap' the sand once it had been sprinkled and get the lines straight. Again these were left to dry overnight. The two end walls were done slightly differently, I wanted to replicate the supporting beams for floors on these. The quickest and easiest way of doing this was to use matchsticks. These were snapped at the appropriate lengths where the walls had fallen in. I widened the gap on the model's original floor level and inserted the sticks into that as well. So, after only a couple of hour's work the building looked like this when all the parts were placed together. I scraped off a small amount of the sand at the ends of each line so that the matchsticks would fit flush against the walls when the whole building was put together and left it to dry overnight. This is as far as I have got with it, so check back for more updates as I continue this build!